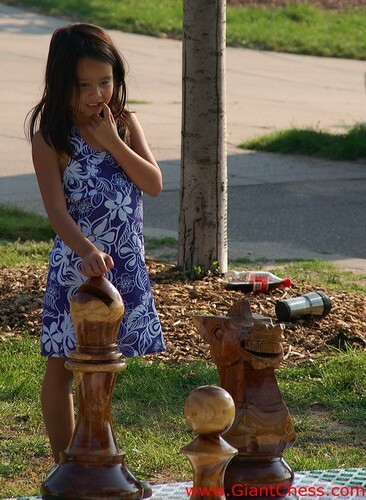 This is one of wood giant chess collection that suitable use for garden game. This kind of giant chess is very popular for kids and adolescents. Perfect for garden and yard decoration, so that your children can enjoy to play at your garden. Let your children explore their imaginative and learn to solve a problem by give them chess game. Garden activity is very fun activity for children. So why you not support them by wood giant chess set. Not for games only. Wooden giant chess pieces also perfect for your garden decoration. Our products are carved by profesional craftsman and polished well. We produce all chess pieces; the King, the Queen, the Rook, the Bishop, the Knight and the Pawns. You can buy wood giant chess set for your outdoors decoration and you can put those chess pieces at your garden for long time. You do not need to wory about its durable, because our pproducts are made of Teak wood material.